Learning letter and sight words is something that often occurs through play. When introducing these topics, have kids use their entire bodies and gross motor skills to explore the letters, this helps really wire those connections in the brain. 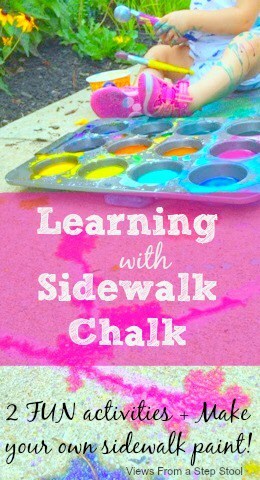 Check out how we are learning with sidewalk chalk! Tracing letters is a great way to learn how to form the shapes that make up a letter. By drawing them really big, the child is using the whole arm to make the shape rather than just the wrist and the hand. 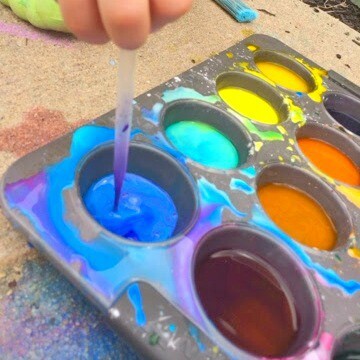 Make some homemade sidewalk paint with just 3 household ingredients and get tracing! It looks messy, but washes right off of the driveway and out of clothes! Draw names or simple sight words on the sidewalk with chalk. Place sidewalk paint in muffin tin or small containers. Provide multiple sizes of paintbrushes or droppers for fine motor practice. Prompt children to trace the letters on the ground with the paint. This activitiy, ‘Sight-Word Splat’, we have played with a few different materials (check it out with a unicorn popper!). The kids love playing this game, and it really gets them moving. Starting with names is a really great way to introduce letter and words because the kids really have a connection with them. Set up a bucket of water or a small pool near the chalk writing. Have your children hold a bucket and stand near the water like a ‘Starting Line’. Call out a sight word. Encourage your child to fill up their bucket and run to the correct word, dumping water on the word. Continue playing until all of the sight words have been erased. They will just love watching the letters disappear beneath them. For younger kids who can’t read yet they can enjoy drawing with the chalk and dumping the water on the letters too! Or try drawing simple shapes or colored circles, even animals like a cat and dog if you’re up for it!